The former National School at Sopwell, County Tipperary. Primary education was officially introduced to Ireland in 1831, with schools run by the National Board of Education. This building apparently dates from six years earlier, but stylistically follows the form of such establishments throughout the country, with two large rooms on either side of the entrance, one for boys and the other for girls: children were segregated by gender rather than by age. According to Samuel Lewis, in 1837 the school had no less than 150 pupils. Seemingly it closed in 1925 and looks to have been converted at some later date into a domestic residence but now stands empty and rather forlorn. Nevertheless, while the timber bargeboards are deteriorating, much of the rest of the structure is still in good condition and it could easily be restored: all the pretty mullioned windows are still intact for example. Note how metal flags flying above the façade gables are punched with the letter ‘T’. This refers to the local landed family, the Trenches who lived close by in Sopwell Hall; presumably it was then resident of the house Francis Trench who was responsible for the building’s original construction. A gentleman farmer’s residence in south County Tipperary. Once part of the Green estate, the house is believed to date from c.1830 and is of three bays and two storeys over basement. To the rear a series of outbuildings forms an attractive courtyard, although many of them have fallen into neglect. The house’s most significant feature is the limestone doorcase reached via a short flight of steps: note how the lintel is carved with a frieze of flowers. The western gable of old St Cronan’s church in Roscrea, County Tipperary. 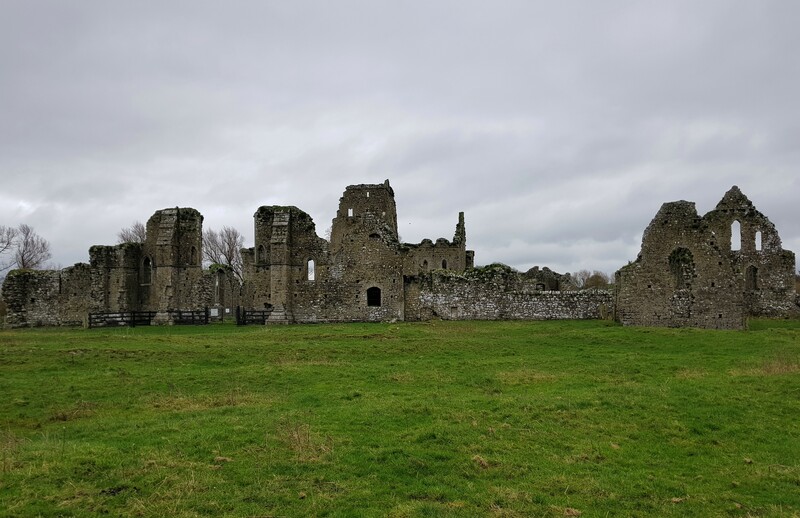 Cronan was a seventh century monk who founded a religious house, originally a short distance from Roscrea but in too remote a spot for pilgrims to find. 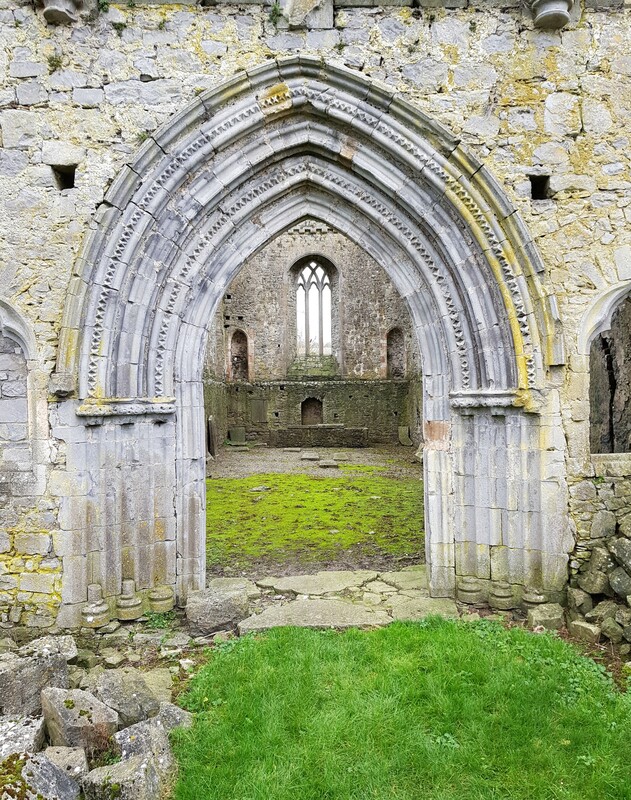 So the monastery was re-established here and flourished for many years: the eighth century Book of Dimma, an illuminated set of the gospels now in the collection of Trinity College Dublin, was written here. Post-reformation the monastic site was used by the Church of Ireland until the early 19th century when the old church was demolished and replaced by the present building incorporating much stone from its predecessor. But the 12th century Romanesque gable was retained and for the past 200 years has served as an entrance to the churchyard. There are a number of fine tombstones in the surrounding graveyard, such as that above dating from 1778, and also on the east wall of the old church the remains of a blocked-up arched window (it looks as though a tablet immediately below has been removed), above which is a badly weathered carved head. The fine limestone doorcase of Lissanisky, County Tipperary where a recent contents sale was held. Its name derived from ‘Lios an Uisce’ (meaning Fort of the Water), the house is believed to date from the 1770s and is typical of gentry residences in this part of the country, being tall and narrow, of five bays and three storeys over raised basement: the breakfront centre bay rises to a shallow pediment. In the mid-19th century it was the residence of the Hon Otway Fortescue Graham-Toler, son of the second Earl of Norbury whose murder in 1839 was mentioned here recently (see In Limbo, April 23rd 2018). Whoever now acquires Lissanisky will need to undertake some restoration since, despite being listed, the building has undergone unsympathetic alterations, not least rampant insertion of uPVC windows. A pair of coach houses in the stableyard of Marlfield, County Tipperary. Dating from the last decades of the 18th century, the house was occupied by successive generation sof the Bagwell family until burnt by anti-Treaty forces in January 1923. One of the country’s finest libraries in private hands was lost in the fire, along with a valuable collection of Old Master paintings. Three weeks later, John Philip Bagwell, who was a Senator in the Free State Dail as well as General Manager of the Great Northern Railways, was kidnapped by the same group that had burnt his home, and held hostage in the Dublin Mountains. After some days he managed (or was allowed) to escape following the threat of reprisals from the government. Marlfield was subsequently rebuilt in a simplified form but the Bagwells eventually sold the estate and more recently the house has been subject to further alterations. It is now for sale.